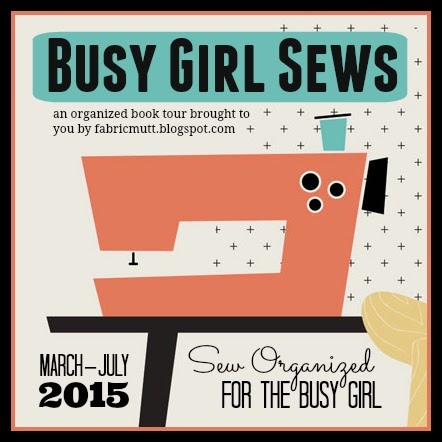 Today is the first day of the Busy Girl Sews Tour, a chance for some of my friends to share their version of projects from my book. Rather than pack a lot into a short amount of time, I decided to make this a weekly tour. Every Monday you'll get a little dose of inspiration and maybe even a few organizing tips from some wonderfully talented sewing bloggers. We're kicking it off today at Lily's Quilts with the only giveaway of our tour. Lynne has three copies of the book to share with you, so be sure to leave a comment on her post! I wouldn't be where I am today without Lynne. Her monthly Fresh Sewing Day blog link-up was the first one I ever joined back when Fabric Mutt was just over a month old, and that involvement changed the life of my blog and my entire sewing experience by introducing me to the encouragement of the online quilting community for the first time. She also gave me the chance to make a few projects for the Fat Quarterly e-magazine when I was very new to pattern writing, and I'm so grateful for those experiences now which trained me for later projects. On top of everything else, Lynne is an incredibly brilliant pattern designer, prolific author, and just plain lovely human being. If you haven't visited her blog before, you must stop by for a visit! Thank you so much for coming along on this tour with us! UPDATE: THIS GIVEAWAY IS NOW CLOSED! CONGRATS TO LOU!! I am so excited to be a stop on the Modern Rainbow blog tour today. Becca and I have known each other since way back in the beginning of my blogging career, and I absolutely treasure her friendship. I am so proud of the work she's done on this stunning new book! As someone who loves a good color spectrum, this book is right up my alley. 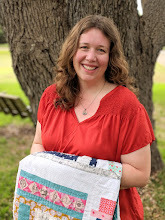 After providing you with some quilting basics, Becca splits her projects into three groups: modern traditional, modern, and improvisational and liberated quilts. I love that there are plenty of options here for quilters with different styles and skill levels. 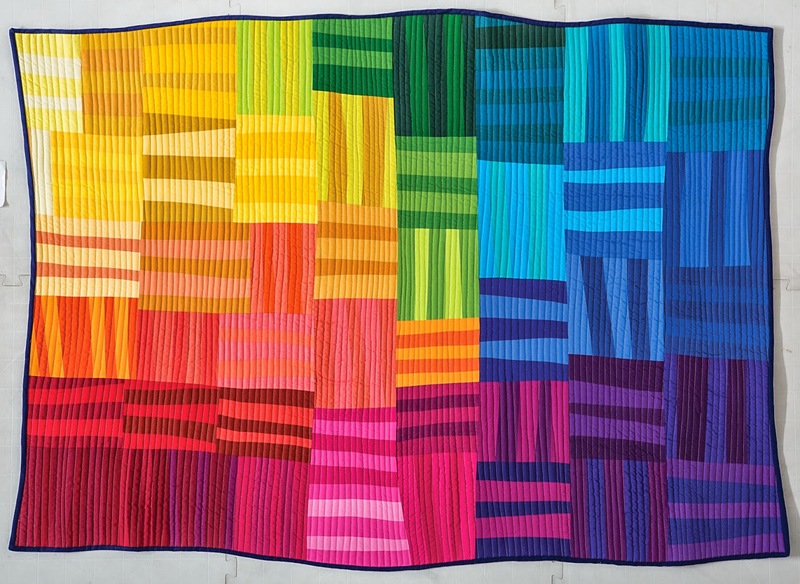 I was immediately drawn to the Rainbow Remix quilt. It's so different from what I usually sew, and I loved the idea of working with solids and trying improvisational piecing for a change. Rather than make an entire quilt, I decided to test the waters with a small pillow made from a Kona charm pack curated by Elizabeth Hartman. It was wonderful not to have worry about matching up seams perfectly with a more liberated approach to piecing, and every time I make something with solids, I wonder why I don't do it more often. These colors and stripes remind me so much of the Bolivian blankets we brought back from Santa Cruz when I was a child. I quilted the pillow in lines of cream colored thread about a quarter inch apart and backed it in yarn dyed Essex linen in leather. I had so much fun making this pillow, and I can't wait to try another project from the book! This Flame quilt is completely gorgeous, don't you think? If you'd like to win a copy of Modern Rainbow (hard copy in the U.S., e-copy for international winners), just leave a comment on this post. I'll pick a winner on Friday! 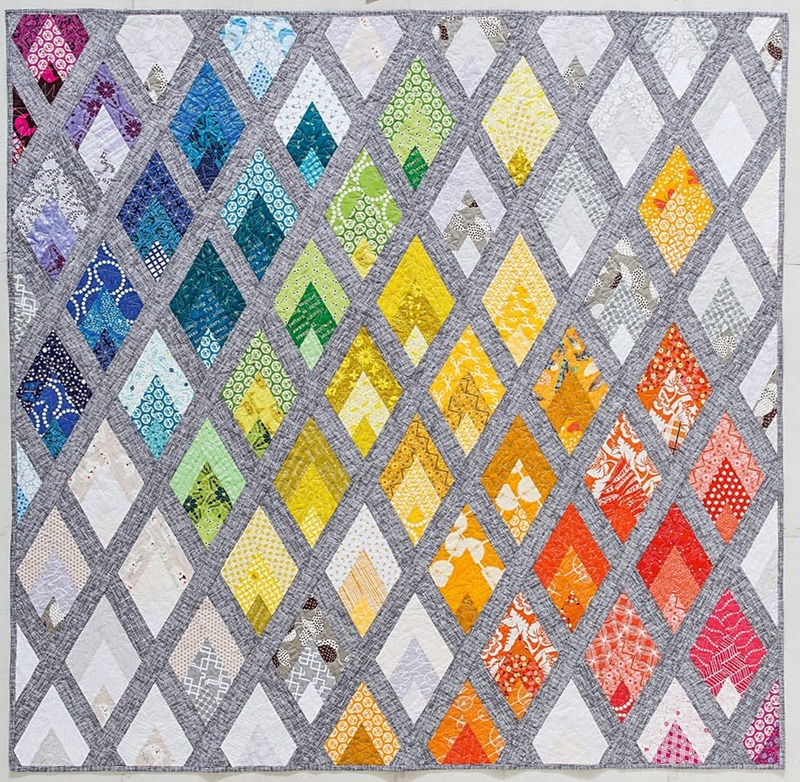 This quilt uses pencil and envelope blocks from my friend Ayumi's brilliant book Patchwork, Please! which I adjusted slightly for the purpose of the medallion format. It also features an extensive amount of fabric from my precious Heather Ross stash. I backed the quilt in a favorite floral print in warm shades from Jeni Baker's Dreamin' Vintage collection, and I kept the quilting very simple since the top was so busy, just stitching around each row of blocks. The quilt is bound with a green floral print from the A is For... collection. As you can see below, my assistant Miss Bunny was not quite ready to part with it at the end of our photo session. I'm linking this up with Sew the Library over at Tales of Cloth, where you must read Jodi's beautiful post for this month. It brought tears to my eyes. Remember that you have till the end of the month to link up a project you've made from a book or magazine! 1. My book has just started to ship out from C&T Publishing and Amazon. I've gotten some wonderful messages from a few of you who have read the book, and I can't tell you how much they mean to me. Thank you, my friends! I wrote this book for you, and I really hope that you'll find it helpful. If you have the time or desire, I would love for any of you who have read it to leave a review on Amazon. Reviews always help me decide if a sewing book is right for me, so I know your thoughts would be useful to others! 2. If you would like an autographed bookplate for your copy of Sew Organized for the Busy Girl, send me an email at hjstaples@gmail.com with your full name and mailing address, and I'll be happy to send you one! 3. The winner of the Just for You giveaway is hart44. I've sent you an email! 4. 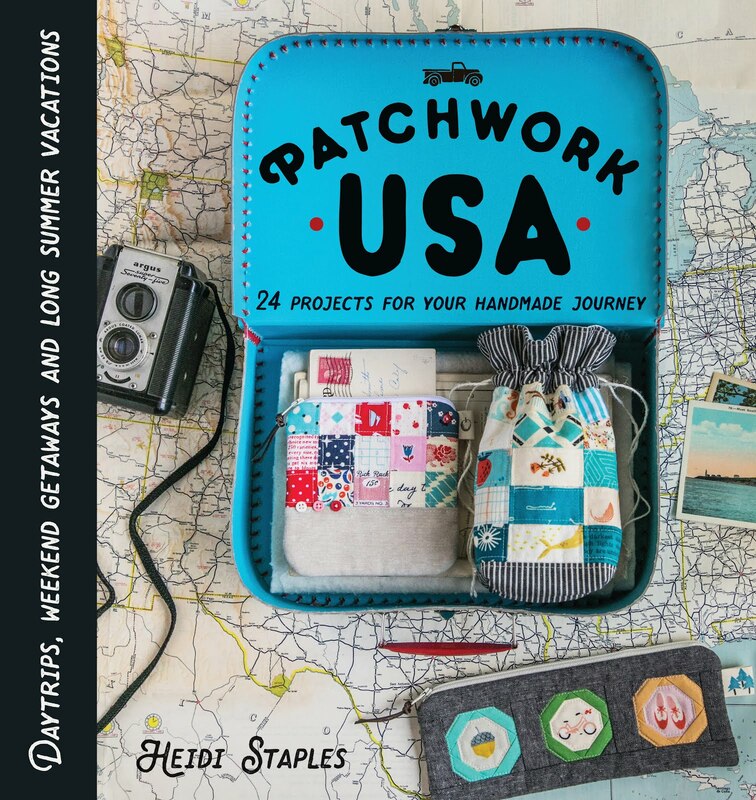 And finally, if you live in the Southern California area, I'll be having a book signing and trunk show at The Quilt Loft in Upland on Wednesday, April 8th from 5 to 7pm. I would absolutely love to see you there! Maker is one of those collections that looks pretty on the screen, but makes a big impression when you see it with your own eyes. I was so struck by the quiet beauty of these prints last month when I opened the package that Art Gallery Fabrics was kind enough to send me. You all know that I'm a big fan of text prints and low volume designs, both of which are well represented here in this mix of motifs that include pins, pattern drafts, and tiny stitches. It took me a while, but after considering several different patterns, I finally decided to use my prints to make an 18" square patchwork pillow. I'm a huge fan of the Around the World block. It's an easy pattern that somehow manages to be traditional and contemporary at the same time, creating those lovely diagonal cascades of color. I alternated dark and light prints for my squares, quilting straight lines diagonally across the darker ones with white thread. The beautiful simplicity of this pillow really speaks to me. It's like a modern ode to spring right there in my family room. I backed the pillow in my favorite text print from the group. There are so many great phrases in here that are just begging to be fussy cut for upcoming projects! Well done, AGF Studio designers. This collection is definitely a keeper. I am so thrilled to be a part of the Just for You book tour today! Caroline and Sarah have put together an amazing book full of fabulous projects that are just perfect for spoiling yourself or someone you love. If you enjoy sewing clothing and accessories, then you absolutely need to add this book to your wish list! I was asked to make the Crafty Satchel which was created by bag extraordinaire Sara Lawson. Although I would recommend this project for someone with at least intermediate sewing skills, I was able to finish it in a single day of solid work, which is always a big plus for me! I paired a sweet floral from Acorn Trail by Teagan White for Birch Fabrics with yarn dyed essex linen in leather by Robert Kaufman, and I love the way they look together. For my interfacing, I used a double layer of thick batting rather than the recommended Soft & Stable which I didn't have on hand. Although my version of the bag isn't as structured as it would be with a foam core, it holds its shape fairly well. Leather handles are a challenge to sew onto the bag by hand, but it looks so professional when you're done! And as you can see above, this bag has tons of room inside it for just about anything you might want to carry with you on the go. My sister pulled into my driveway when I was outside taking photos of the satchel and helped me out by holding it for one last shot. "It looks beautiful," she said, examining the front while I took a few more pictures. "It's yours," I answered. "Happy early birthday!" Her gasp and smile reminded me why I love making gifts for family and friends. It's all so very personal -- just the way it should be. If you'd like to win your own copy of Just for You, please leave a comment on this post. I'll pick a winner on Friday. The giveaway is open to everyone worldwide (international readers will win an e-copy of the book). So many thanks again to Caroline & Sarah for letting me be a part of this tour and for putting together such a beautiful book! Ever since I started Fabric Mutt, I've been very careful with my children's privacy. You hear a lot about Bunny, Bear & Mouse on here and sometimes you catch a little glimpse of them, but that's about it. So it was kind of a big deal when my husband and I decided that it would be special to include a picture of my girls in Sew Organized for the Busy Girl. These little girls make me absolutely crazy sometimes, yet they make life so good. When I think about sewing, it's almost impossible for me to not think of them at the same time because they've been right there with me from the beginning. How many hours have I spent working at my sewing machine with them standing on their tiptoes by my side to see what I'm making? How many packages have I opened to a chorus of, "Oh Mommy, it's so pretty!" and immediately had three more hands reaching out to pet the new fabric? How many times have I checked on them in the night and felt a little emotional to see them cuddling in their sleep with the quilts we made together? I look at these pictures, and I'm reminded that this is why I sew. I really believe that sewing has made me a better mommy in so many ways. It not only gives me the chance to burn off the stress that comes with parenthood, but it allows me to bring something beautiful into my children's lives, to show them that you're never too busy to be creative and that it's never too late to learn something new. So let me introduce you to (from left to right) Mouse, Bunny & Bear...my favorite people in the whole wide world.